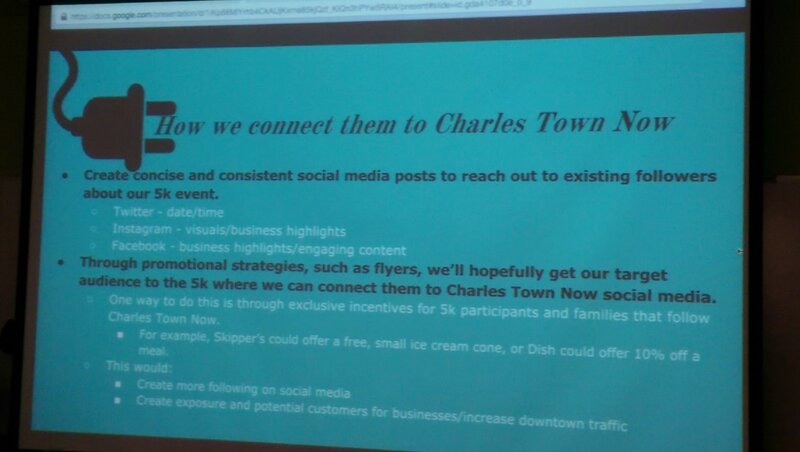 Students in my COMM 470 Strategic Campaigns (syllabus from previous year) had a big surprise last Tuesday when they presented their campaign plans to the client, a local non-profit, Charles Town Now. The purpose of the class is to teach students the campaign planning process. In learning that process, students take on a client and complete all of the background research (e.g., client analysis, publics analysis, situation analysis, etc.) and come up with a plan to address the client’s problem. This includes the opinion leaders, key messages, objectives, goals, strategies and tactics as well as all of the content that would be needed to implement their plan. That means they create any materials that the client would use to execute the plan, whatever that may be. Think of it as a ‘turn key’ situation where the client would be able to take over the plan and execute it. This semester, both student teams determined that hosting an event was the best solution to the client’s need. So, students planned the events and needed materials to execute the events. But, because the class is focused on teaching the process, students don’t go out and execute their plans (now that they know campaign planning, students plan and execute campaigns for their individual capstone class projects). However, the president of the non-profit loved both proposed events so much that at the end of the presentations he asked how Charles Town Now could work with the students to put their plans into action. The board agreed, and, since the class is over and we can’t do the project as a class project, now the students are going to get the opportunity to work as interns next semester for Charles Town Now! The students were super excited and pleasantly surprised! I’m extremely proud of these students. This is their first experience with campaign planning and they had a very tough problem to address. Charles Town Now is seeking to build a relationship with 17-30 year-olds in our rural county here in West Virginia. The aim is to bring young people to downtown, a downtown on the rebound from years of struggling. It is a downtown that primarily caters to older shoppers with a lot of antique and second hand shops and several vacant storefronts. That’s no easy task. The great folks at Charles Town Now are energized and forward-thinking. They are working to revitalize the town, attract new businesses, and help make it a central destination for local residents, like it once was. So what were the solutions the students came up with? 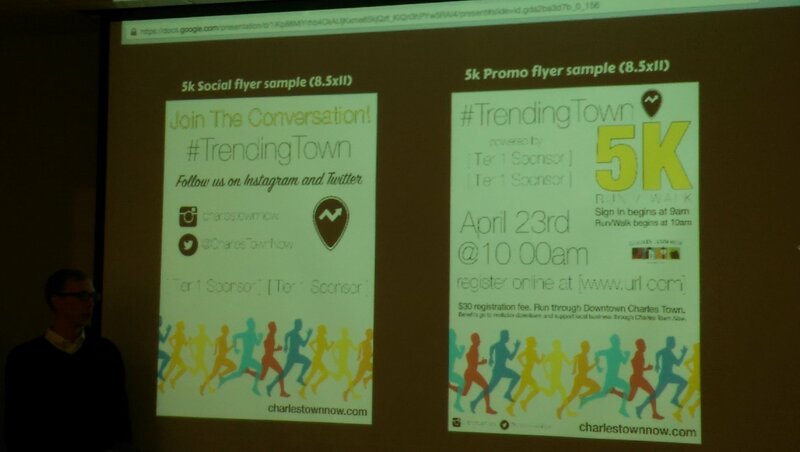 #TrendingTown 5k, “Putting Charles Town on the Map” – More than just a 5k, #TrendingTown aims to help young people see Charles Town as their place to start a trend. It is designed to harness hashtags and start a conversation. It is both a 5k through town and fun-filled all day event with local music and local vendors. It is a fundraiser for the town aimed at bringing to the exercise community in nearby counties to Charles Town. Champion of Charles Town High School Football Parade & Tailgate – Charles Town sits between the two high schools in our county. When the two teams play in football, it draws a big crowd. Yet, neither team is really associated with any one town in our county; for example, there are no homecoming parades through downtown (much different from where I grew up, where each school represented a town). The students’ idea is to bring the spirit of high school sports into downtown by hosting a tailgate and parade involving both schools when they play one another. The team who wins the game, is the champion of Charles Town – the place that divides the two schools – and holds the rivalry trophy for the year. By tapping into the existing local sports culture and exploiting the fact that there isn’t a big cultural tradition like a homecoming parade to excite and involve the students, experience for the band, the Champion of Charles Town offers a new tradition. It creatively addresses the problem of getting 17-30 year-olds because it can bring in members of both schools’ football, cheer leading, band, and color guards, as well as their siblings in the target market. The secondary audience of parents and others who follow the local sports will also come downtown for the event. There are promotional tie ins between the town and the school sports, and local restaurants will be vendors at the tailgate. This is the second time I’ve taught Strategic Campaigns. Last year, students worked with Charles Town Now on a different project. But, this is the first cohort of students that started at Shepherd when I started here and that have gone through the Strategic Communication concentration that I created and that was launched in my second year at Shepherd. So, this is a milestone for me and the concentration. And, I’m extremely proud of the hard work, willingness to learn and push themselves, and successes this group of students has had. There is so much I want to accomplish here at Shepherd in terms of creating opportunities for my students. And I feel like we are beginning to build some great traction and establish our students’ reputation among non-profits and companies in the region. I’m looking forward to watching these students continue to grow and succeed and to future opportunities in 2016.